"Keeping up with the band’s tradition to include the word 'death' or 'dead' in their titles, their title of their sixth full-length alone Ritual Death Metal feels like a warning. In the wake of an already impressive 'Death Gods' three years ago, this new offering to the Ancients been recorded last summer with Swedish wünderkid Tore Stjerna in Stockholm in his world-renowned Necromorbus studio, where most famously Watain but also Ondskapt, Funeral Mist, and many others have sworn a pact with the Great Horned One. "Guest starring on the album is one LG Petrov from Entombed, who provides vocals for the track 'Like Worms Upon The Lands.' Cover art is by Babalon Graphics, other layout work by Costin Chioreanu of Twilight13 Media. "As eclectic as the label is, Svart Records have a strong foundation in death metal, having reissued albums by vintage acts like Abhorrence, Xysma and the resuscitated Convulse. However, Deathchain is the first contemporary death metal band operating on the label. Each member sports an impressive curriculum vitae of musical misbehaviours that reads like a Who’s Who of the Finnish extreme metal scene (Demilich, Deathbound, Ajattara, Forgotten Horror, and so on), and the band's two guitarists are already part of the SVART family with Jess and The Ancient Ones. 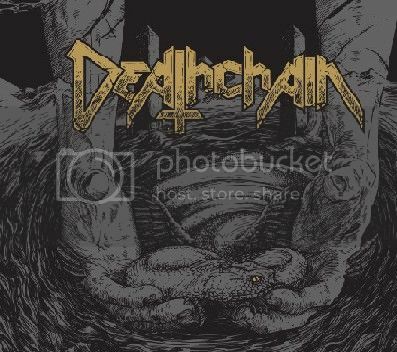 "But it’s the sheer intensity of its music that has put Deathchain at the top of the foodchain as, unlike others, they’ve taken their time to shed their previous collective skins one by one. And what started off back in 2003 with Deadmeat Disciples as one frantic yet somehow still conventional thrash/death vehicle has now become, a decade later, an altogether even more unique and ten-times-more-intense beast." "Rebellion - rebellion and liberty, they've always been at the heart of what we do," says guitarist Corpse. "During our years as a band, we have grown to disrespect all boundaries, and the fire inside burns ever higher." Deathchain's "Ritual Death Metal" applies elements from the entire extreme metal spectrum, from the doom-laden rumblings of “Like Worms Upon The Land” to the blackish fury of “King Pazuzu.” The result is dedicated to summoning ancient Mesopotamian deities. Says Corpse of the theme of the album, "Thematically, we have moved closer to the source, and all laughter around it has died. We work on our music and lyrics with the greatest intensity and map our inner beings to find the Lightbringer, who stands beyond everything. On this album, we concentrate on the Mesopotamian pandemonium as we examine the different manifestations of the Adversary." 0 Comments on "Deathchain Reveals New Album Details"